A couple of weekends ago I was staying in a cottage on top of a chalk downland hill in Wiltshire. The views are stupendous. Look south on a clear day and you can see the Isle of Wight. I love the wealth of Ancient History here. Wiltshire is criss-crossed by a number of ancient, Prehistoric roads, the most famous being the Ridgeway, on the north side of Salisbury Plain. 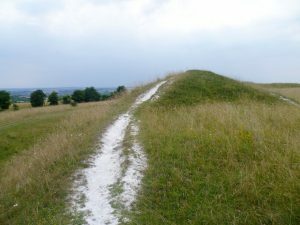 The Ridgeway is an 87 mile stretch of prehistoric road running along the top of chalk ridges, above the spring-line, and at least 5,000 years old, possibly more. It is a wide road – farmers can drive tractors along it. So why did our Stone Age ancestors want a road so high up? 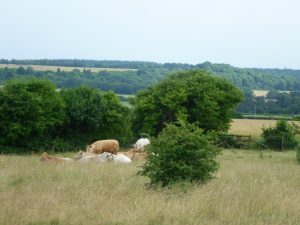 Britain was forested then and the top of a chalk ridge would have been safer than the lower wooded slopes which harboured wolves, wild cats, wild boar and even bears. Trees were sparser above the spring line, and the Stone Age travellers had warning of danger approaching. The Ridgeway has a number of spurs and one of them goes past my friend’s hill top cottage: a Ridgeway, rather than the Ridgeway. If you look closely at the Ordnance Survey map the whole of Wiltshire is covered with ancient ruins of some sort: tumuli, hill forts, long barrows, mill mounds and a number of places marked as Gallows Hill. It is a county full of archaeology. 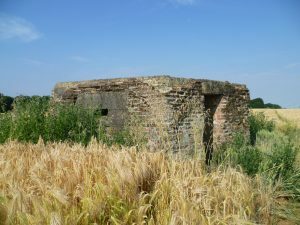 World War II pill box dating from 1940. Thousands were built to defend the country from invasion. Note gun slit on the left. The only things which weren’t marked on the O.S. map were two World War II pill boxes – perhaps they were simply too modern. The one above looks pretty basic. My first morning, I went for an early walk. 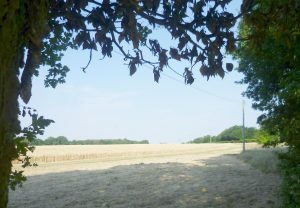 The field on one side was full of ripening barley and the Ridgeway road itself was very flinty. It’s not easy walking and wet chalk can be slippery. I kept my eyes peeled, hoping to find a Stone Age flint arrow-head or a scraper, but my luck was out. 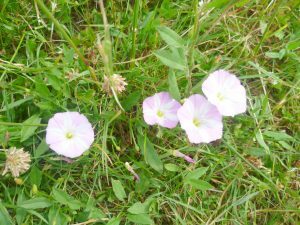 But I loved the flowers, like the ground-hugging small pink and white field convolvulus above. 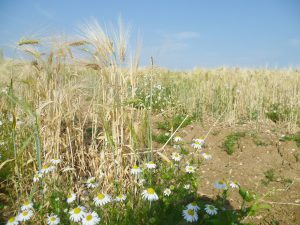 And the mass of ox-eye daisies in the rough between the Ridgeway and the barley looked very at home. It’s strange to think that Stone Age people might have seen similar ox-eye daisies 5000 years ago. But, at that date, they were still hunter-gatherers, so the barley would have been smaller and more primitive. Figsbury Ring. The chalk underneath the outer wall has been exposed by people walking up it. 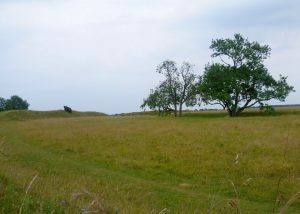 The following day we visited a hill fort called Figsbury Ring, just north-east of Salisbury. In theory, it’s looked after by the National Trust but, as far as one can see, it’s left to its own devices. The photo above looks south-west towards Salisbury – we could just spot the cathedral spire. Stripped of its turf, the hill fort would have been visible for miles around. Today, it’s off the beaten track and the few people we met seemed to be butterfly enthusiasts. The cows looked contented and undisturbed, at any rate. Nobody knows much about Figsbury Ring. It’s thought to be Iron Age (c. 600-100 B.C.) but, unusually, there is another ring inside the outer one, which may well be Neolithic and much older. 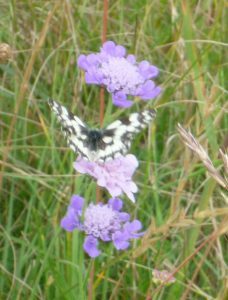 It is, however, a haven for butterflies, and I was delighted to see my first Marbled White. 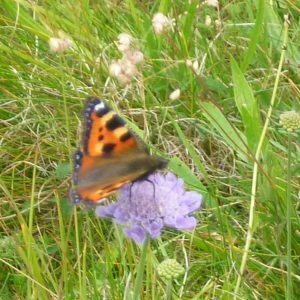 In fact, scabious, the blue flower it was on, seemed to be the flower of choice for the butterflies. Above is a small Tortoiseshell butterfly on another scabious. 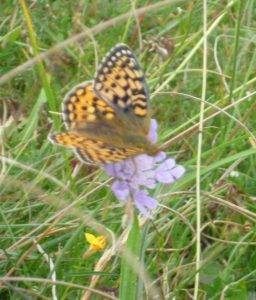 The Fritillary butterfly above is also on a scabious. There are about twenty different sorts of Fritillary butterflies – identified by their size, and the colour of their undersides – but they didn’t wait around to be measured or examined! 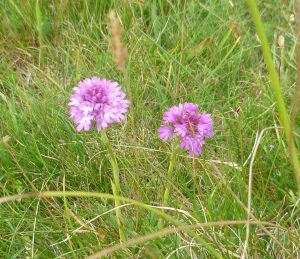 However, I was thrilled to find some Pyramidal orchids which love chalk downland. And there were plenty of other flowers, too, like yellow Lady’s bedstraw, and some large juniper bushes. I last saw juniper bushes in the Scottish Highlands on a peaty hillside (c. 600 miles north). 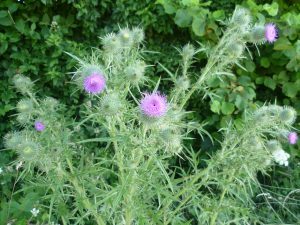 It was about a quarter of the size; they must be very adaptable plants. 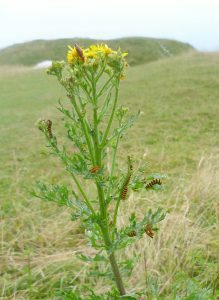 My last photo is of a ragwort absolutely covered with cinnabar moth caterpillars. Ragwort is poisonous and farmers are obliged by law to pull it up if it appears. If ragwort inadvertently ends up in a hay bale, it could make any cows eating the hay very ill indeed. Fortunately, the caterpillars will eat up the ragwort. I’ve enjoyed writing a post that’s completely different; it was quite a challenge to get the butterflies to sit still long enough to be photographed! And there’s something very special about walking in the footsteps of Stone Age people who first came here 5000 years ago. 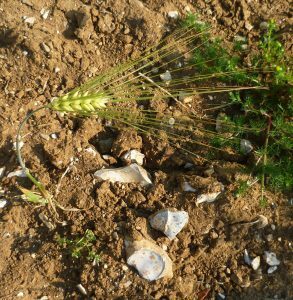 Lovely post of beautiful countryside, flowers and butterflies, plus that mystery and the reminders of early human settlement. Thanks for taking the trouble. I know what you mean about photographing butterflies!